Sgt. 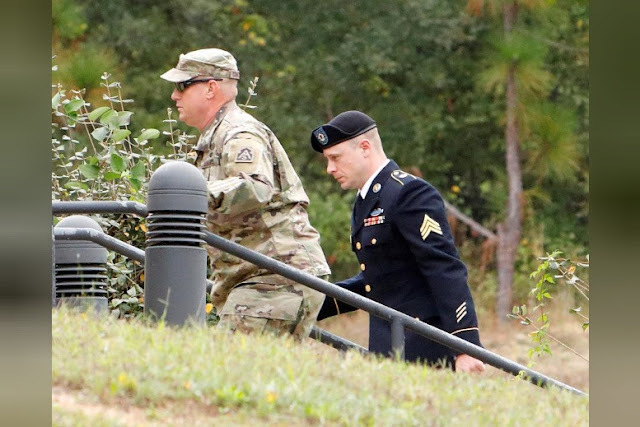 Robert B. Bergdahl (R) arrives at the court house for a hearing in the case of United States vs. Bergdahl in Fort Bragg, North Carolina. FORT BRAGG, N.C. - U.S. Army Sergeant Bowe Bergdahl, accused of endangering fellow soldiers who searched for him after he walked off his combat outpost in Afghanistan in 2009 and was captured by the Taliban, pleaded guilty on Monday to desertion and misbehavior before the enemy. Bergdahl’s lawyers had argued that such comments made it impossible for him to get a fair trial, but military judges refused to dismiss the charges.